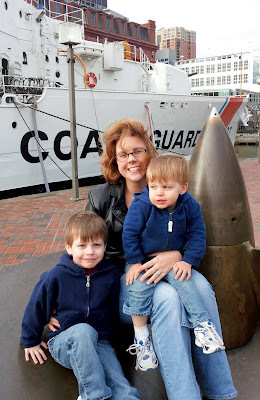 On New Year's Eve, we headed to the Inner Harbor, in the city of Baltimore. On the way there Daddy, told us we would see a big boat! Little did we know that we were going to tour the historical, US Coast Guard Cutter, the Taney. Mikey and Ryan thought the the 500lb anchor was huge! Mikey, Mommy, and Ryan...it was a little windy! The propeller was also huge, Mikey was just in awe of the sheer size of everything! Standing in front of a list of the names of the crew members. Yes, Ryan was not happy about sitting up so high! Daddy then showed the boys the water and the ropes, that tied the boat to the dock. Mikey asked if he could lift them...he tried, and found out that he could not! This boat is one of the last two boats left from Pearl Harbor, humbling to say the least. I am amazed that the crew's bunk beds were 3 high, and the men where packed in like sardines. The galley, or kitchen; fed hundreds of men, three times a day, and it was very tiny! Men lived for months on this boat, and it survived the Pearl Harbor! As we were leaving a veteran met us, and shook our hands. He told us that June will be the 60th anniversary of the Battle of Midway, and there will be celebrations most of the summer. I never mentioned my Grandfather, but he certainly brought everything full circle! You can read all about the USCGC Taney, here. Santa arrived, filled the stockings; and was pleased with our tree! He left the boys a note, thanking them for taking care of Buddy and Max. He then ate the cookies and drank most of the milk! I was really afraid that the morning would be an early one, but the boys woke us at 7:15 am! They looked in their stockings first, and oooed and ahhed over each little thing. They then couldn't wait to get Daddy his Superman movie, almonds, and cashews. Ryan found an "iXL" under the tree, and was so happy to finally have a hand held learning game like big brother! Mikey was really into Christmas this year! Paper flew, he yelled, he clapped...so every picture of him was blurry! This was the best picture I got of him, he is holding his new ornament from Grandma. Thank goodness, the very last present under the tree....WAY in the back, hidden behind everything else, was the TRASH TRUCK! Cant even imagine what Ryan's Christmas would have been like, had he not gotten a trash truck from Santa Claus. Ryan never changed his answer, when asked what he wanted this year. In his sweet little 2 year old heart, he just knew that if he really wanted a trash truck, that his wish would come true! Talk about one little happy boy! I was the one handing out gifts, and attempting to take pictures, so I am not in one picture! It was a very relaxing Christmas, and I cant remember the last time we didn't have to run all over the place, after opening gifts! The kids had chocolate chip waffles, and stayed in their pajamas most of the day! We then had a wonderful ham and turkey dinner with our friends Shelley and Bob! Thank you to our parents for sending such amazing gifts to the kids, it is a true Blessing to have so much under the tree, when there are many who go without. Merry Christmas to all of our family and friends. May each of you have a healthy and joyous Happy New Year in 2012. With Santa on his way, there was much to be done for his arrival! Mikey and Ryan ready to feed the reindeer! Mikey was really into what he was doing, he would pinch and then sprinkle the oats out on the ground for the reindeer. Where as Ryan just poured his out on the ground. Pajama Elf arrived, and left the boys new fire truck pajamas! Mikey and Ryan then set out the cookies and milk for Santa! Sadly it was time to say goodbye to Buddy and Max. Yes, there were tears, and the kids really meant everything the said to their dear friends! Lastly Mikey, hung the Santa Key on the door! The boys were so cute, getting ready for Santa Claus! Mikey made me laugh when he said "We were like Prep & Landing!" A Box from Ginny & Bert! Mason and Madisyn's Christmas elves, Ginny and Bert sent us a package! The boys love surprises from the Fullers, and couldn't wait to see what goodies were in the box. Ginny and Bert shared the Elf Love, and sent us "Prep and Landing!" We recorded this when it aired early, in December...we have watched it MANY times! find Ratchet and Crossbow, in the box! Ginny and Bert also sent us "Snowman Soup," a really cool hot coco kit! Mikey and Ryan loved the chocolate covered jelly beans, pull back cars, and finger car lights. Mikey asked to frame the picture of Mason and Madisyn, so he could added it to the other picture he has of Mason! We really miss the Fullers, and can't wait to see them the next time we visit St. Louis! The boys weren't exactly sure what to do with the goodies that Buddy and Max left this morning. They knew the reindeer, needed a snack; but as to what the next step ways...a little help mom? So you put the oats in the jar? And what is the glitter for? Oh, Mommy this is fun! Oats and glitter in the jar...and it is magical glitter to help the reindeer fly? Buddy and Max were very proud of the reindeer food that the boys made! We were introduced to Pajama Elf, from the Fuller family! A really cute way to get your kids to wear new pajamas, but with an elf twist! Buddy and Max left the items needed to make reindeer food; a pretty jar with label, magical glitter, and rolled oats. Max also brought us a Magical Santa Key, that Santa can use to open any door! This is the candle that we set our for Pajama Elf. Mikey loved the key, and wanted to try the key for himself, but quickly learned that the key does not fit our locks! I guess that is why Santa has the magic!? Ryan was fascinated by the jars, and wanted to know why they were empty! *The idea of pajama elf can be found, here. *The tag for the Santa key was found here. *The labels for the jars were found here and here. *I found the spice jars at Ikea, they can be found here. Mikey and Ryan LOVE Disney's Prep and Landing! The elves found a paper doll set, and the container of gum drops! They spelled the boys names, and ate a few while working...shh, don't tell the boys! Ryan and his glorious bed head, quickly found the gum drops! Mikey and Ryan checking things out! Buddy and Max brought a Fort Kit, for the boys. They also made a mini fort and found a flash light! The Fort Kit included sheets with tie downs, flash lights, clips, clothes pins, and glow sticks! Mikey and Ryan's Fort Kit! Mikey made this fort...a little rough around the edges, but he was pleased with what he made! Ryan and Mikey loved their new fort! Mikey asked if I knew the password? **Thanks to Saltwater Kids Blog for the inspiration! Loved making this kit, here is the link. In honor of our family and friends who are Jewish. Buddy and Max, wanted to learn all about Hanukkah. Buddy couldn't wait to light the first candle on the children's menorah. Max loved playing with the dreidels, and eating lots of chocolate gelt coins! Mikey and Ryan loved reading the books and watching Shalom Sesame! The boys played with their dreidels all day. **Happy Hanukkah (Chanukah) to Lindsay, Sarah, and Jeffery Wehmer. Also thinking of my Aunt Dani and Ricky's family, during this special time of year!